Built in the Greek modern style, located in Kos Town, one of the finest areas in Kos. It has 47 rooms, three floor building, one elevator and a beautiful garden with a big terrace at front of the Hotel. All our rooms are well maintained with all the basic amenities to make your stay comfortable. All our rooms are located on one building block, bright, airy and open out to a private balcony. 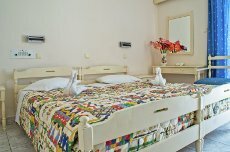 Rooms have been decorated following a Mediterranean-Greek style and all rooms have private bathroom with shower and toilet. Relax on the wide balconies and enjoy your drink under the Greek sun. Renovated rooms ready for season 2013!